KUCHING: The Occupation Permit (OP) for the Industrialised Building System (IBS) school block of SK Jalan Haji Baki was not issued because the contractor failed to do a proper job. Padawan Municipal Council (MPP) chairman Lo Khere Chiang said there were a lot of defects and as such the consultants were not willing to apply for an OP from the council. “The IBS, implemented by the Federal Ministry of Education, is just a building system that is supposed to speed up the job. “The Federal Education Ministry implemented the project but failed to complete it as the contractor did not do a proper job. “Work was not completed and so the supervising architect and engineer have not submitted the OP for approval,” he explained. 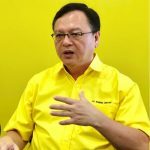 Lo said DAP Socialist Youth (DAPSY) Sarawak publicity secretary Abdul Aziz Isa was ignorant for blaming and hurling baseless accusations against MPP for not issuing the OP. Lo said the previous government had approved RM20 mln for the new SK Jalan Haji Baki project. “Following this, an IBS school was built to house students temporarily so that the old school can be demolished and a new one constructed over the land where the old school block now stands. “That was what the approved RM20 mln was intended for – a smaller but temporary IBS block and a new permanent school block. That is why that IBS school block costs RM2.93mil, a portion of the allocated RM20 mln,” he added. Lo said the temporary IBS school had to be built so that the students could have a place to study in when they demolish the present dilapidated timber school block. Lo said it was malicious of Aziz to blame him and MPP for not issuing the OP when the consulting architect and engineer were not willing to submit any applications for OP as it would be against their conscience and credibility to do so. “Aziz needs to check his facts properly before accusing MPP,” he said, adding that the council and himself were not to be blamed for the horrendous performance of the contractor. Lo noted that the Education Ministry, for some reason, had appointed a Peninsular Malaysian contractor despite Sarawak having capable contractors to do a simple building job. He said Aziz should go back to the Education Ministry since it was the federal authority’s decision to build the IBS. Lo said though it was not Sarawak’s responsibility, he had allocated RM50,000 from his Rural Transformation Project (RTP) fund to do rewiring in the classrooms at the 50-year-old school while waiting for the IBS block to be completed. “The imminent danger to our students and teachers is obvious and hence the immediate allocation of the RM50k is a no-brainer,” he pointed out. Lo: No OP due to bad contractor 0 out of 5 based on 0 ratings. 0 user reviews.